Total Fail…Lazy and sick fail! My appointment was at 4:30…diagnosis…Bronchitis. 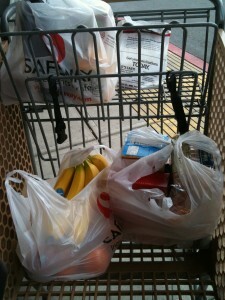 I had two prescriptions in hand and was off to Safeway. I asked the doctor to give me some meds that will knock me out and cease the cough! I love meds like that and can’t wait to take it soooon! So I’d like to share what came home with me. The title of my post is Total Fail….Lazy and sick fail! I am sure you can see from the picture why it has this title! If not, here’s a clue! 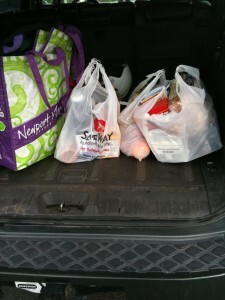 Here are the plastic bags in the car next to………my recycled bags! I realized I didn’t have them about half way though the parking lot! Normally, I would have returned to the car to get them, but …DANG! I was just tooooo DANG lazy! and tooooo sick…more lazy than sick actually! I limited my shopping list so I wouldn’t be using too many plastic bags. Any way, I wanted to share my fail with you! not sure why…..hmmm! What do you use yours for??? ?